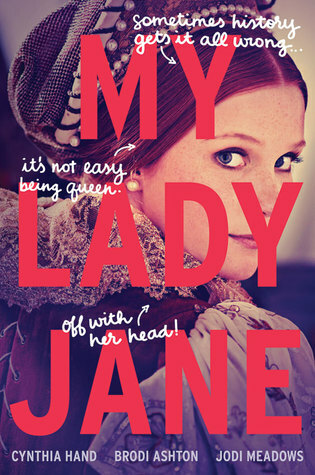 Home » Reading » My Lady Jane Release Day Blitz! My Lady Jane comes out today! Happy book birthday to the three lovely ladies responsible for this book: Cynthia Hand, Brodi Ashton, and Jodi Meadows. I’m quite excited to read this book, and I have a little list of reasons why. The synopsis of My Lady Jane sounds hilarious and oh, so fun. It’s like The Princess Bride? Yes, please! That book (and movie) are hilarious and staples of my middle school and teen years. Marriage to a stranger? Always an entertaining storyline. Mix in a little rebellion and mischievousness in a plot to take over the throne? Yup. Another fun storyline. Oh, and she has to figure out how to be a queen? Sounds a little like The Princess Diaries, another staple of my middle school years. The cover of My Lady Jane is awesome. Just look at it. I love the bold lettering of the title. I love the scribbled notes. I love the look in Jane’s eye in the cover photo. Admit it. It’s an awesome cover. The authors seem like super neat ladies. Three friends who write books decided to tag team and write a book together. My childhood best friend and I dreamed of doing that but it is HARD to write a story together. I want to see what a final product of this kind turns out like. And see how these ladies rewrote history to give Jane a happier ending. What do you think of historical re-imaginings? I AM INTRIGUED! You’ll have to tell me how this one is!! I will once I get it. 🙂 I’ve only read the first chapter and it’s lovely.